The La Nouville Etoile slowly plies along picturesque inland waterways of Holland, France and Belgium lined with magnificent foliage and speckled with charming towns. The La Nouville Etoile includes a large sundeck with jacuzzi, a main deck with a panoramic lounge, a bar area with piano, a dining room, a fitness room and an elevator. There are 4 oversized suites (over 200 square feet), featuring flat screen monitors with internet connection, satellite television and video, double sink bathrooms with large showers. Meticulous attention to detail is evident throughout - from the selection of the linens, to the fresh fruit and flowers in each suite. The warm, elegant teak interiors, subtle color schemes and pleasant furnishings invite you to relax and enjoy. After your pick-up by our driver you will driven to the barge moored in the heart of Paris for a wonderful champagne welcome. Time to relax and cruise past Notre Dame and the Eiffel Tower. Moor the night in the Latin Quarter where you will enjoy your first gourmet dinner on board. . Morning cruise out of Paris onto the River Marne. After lunch you visit the magnificent Chateaux of Vaux-le-Vicomte. 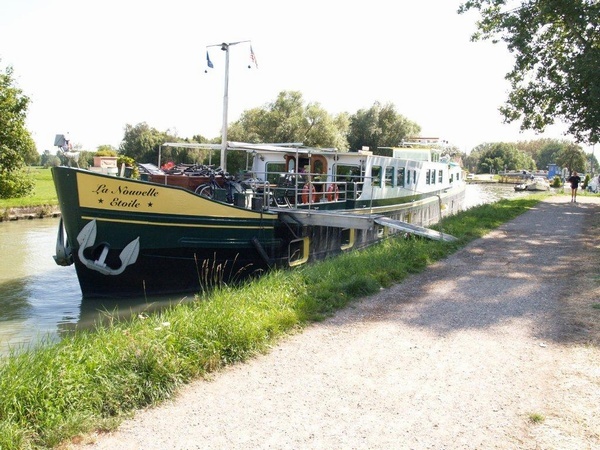 Rejoin the barge in Meaux in time to stroll around and vist the cathedral. Morning cruise from Meaux to La Ferte and an afternoon visit to Coulommiers, one of the centers of Brie cheese-making. You will enjoy a tasting of the variuos Bries of a master cheese maker, along with wines from his excellent cellar. We are now in Champagne and on our way to Charly-sur-Marne. Stop to enjoy the wonderful champagne of a small family vineyard before an afternoon cruise to Chateau Thierry, the scene of American battles in World War I. Optional visit to Belleau Wood battlefield. The Marne takes us through covered hills dotted with small wine villages to the delightful little town of Damery. Afternoon visit to the cellars of Moet et Chandon for a private wine tasting. We leave the river Marne for a small canal leading to Epernay. Visit the Abbey of Hautvilliers where the monk Dom Perignon first made champagne. Afternoon drive to Remis Cathedral. Wonderful farewell celebration on board and your last gourmet dinner on board. After your last great breakfast on board you will be driven to either the airport or your hotel.